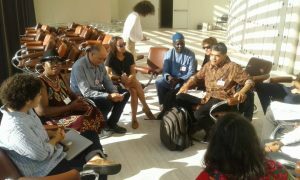 (Geneva, September 21, 2018) Understanding the complex situation that the peasants have to face at the UN HRC is crucial to obtain a legal instrument that recognizes and protects their rights. Each UN HRC negotiation session in Geneva gradually contributes to the completion of the declaration. For peasants, who rely on their knowledge of building relations within their communities and also on allies’ expertise, it’s not easy to navigate the system. For them, it is difficult to engage and lobby Governments, the civil society and all relevant stakeholders to contribute actively and constructively to the recognition of their rights. 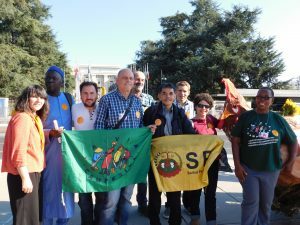 In Geneva, each day starts with a preparatory meeting, to establish a strategy and to assign tasks, after what, peasant delegates of La Via Campesina and allies including CETIM and FIAN International, disappear into the corridors and meeting rooms of the United Nations. Then they briefly meet for lunch and quick updates, and quickly rush back to their assignments. The day ends with a series of meetings. The delegates reach out to targeted representatives of the country missions, some familiar faces, always warm, eager to listen and to lend a hand to open doors to move the peasant rights initiative closer to obtaining a legal instrument. Some representatives are not so warm but curious, others puzzled. New bonds of friendships are established, exchanges are short, usually lasting less than an hour but are worth the effort. Such interactions and discussions sometimes lead to a promise to consult and make a phone call to the “capital”- as they call it here in Geneva- for a decision. Delegates keep track of the most relevant meetings within the UN Human Rights Council and select in which one they can find the representatives they are looking for. Important insights and information are shared, issues clarified, some negotiated. Peasant delegates navigate through this process, learn and sharpen their negotiation skills. They carry with them the heavy load that their communities have put on them and take their responsibilities seriously to make this historical process a successful one. This has been the life of each delegate who comes to Geneva for the last 8 years. It is a permanent struggle for the peasant rights initiative. Delegates come from diverse communities, culturally and geographically, each unevenly affected by capitalist exploitation and violations. This brings different voices to the discussion on how to move forward in the process. However, it is the common struggle for the protection and realization of their rights that brings and knits them together, which embodies of the slogan of La Via Campesina “Globalize the Struggle, Globalize Hope”. Some have tried sowing the seeds of dissent to derail this important initiative, but the peasants remain united and determined. The victories, in the form of resolutions by the UN Human Rights Council since 2012, galvanize the delegates to work harder to see the completion of the process. The years of effort and dedication, the expectations of the grassroots movements in this process have made our movement stronger than ever. This long and hard struggle led by peasant and other people working in the rural areas will end the violation of their rights and restore peasants’ dignity. Each resolution strengthens the delegates’ determination and is a major step forward towards the promotion and protection of the rights of peasants, smallholder farmers, agricultural workers, indigenous people, peasant women and landless people, fisherfolk communities, and of different people working in rural areas. Even in this 39th session of the UN Human Rights Council, peasant delegates are convinced that the final text of the declaration will be adopted, paving the way to the UN General Assembly in New York for final adoption.